This week’s Foody Friday will feature a dish that I indulged in at least twice daily, if not more. It’s a perfect breakfast, lunch, dinner, and late night snack. 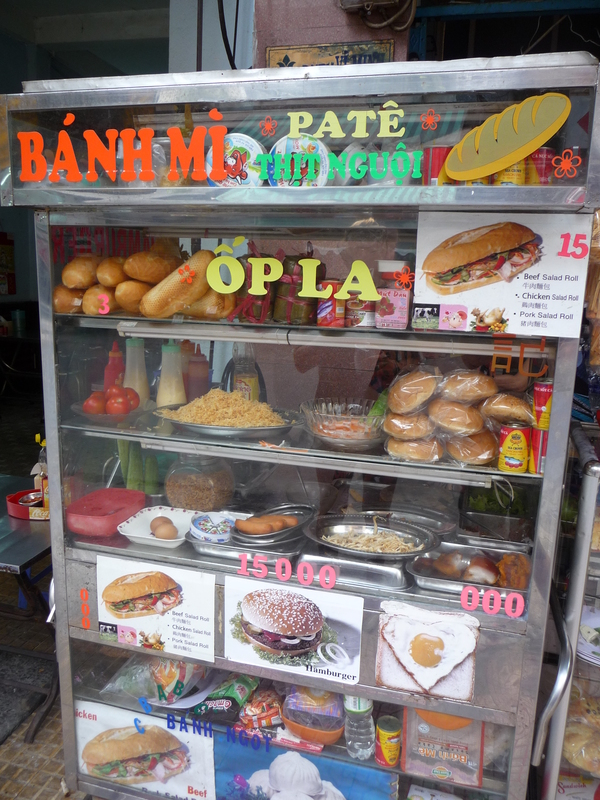 It’s absolutely delicious, it comes in multiple varieties, it’s available on virtually every street throughout Vietnam, and it should never cost more than a dollar – IT is Banh Mi. Banh Mi is essentially a delicious sandwich on a fresh baguette. 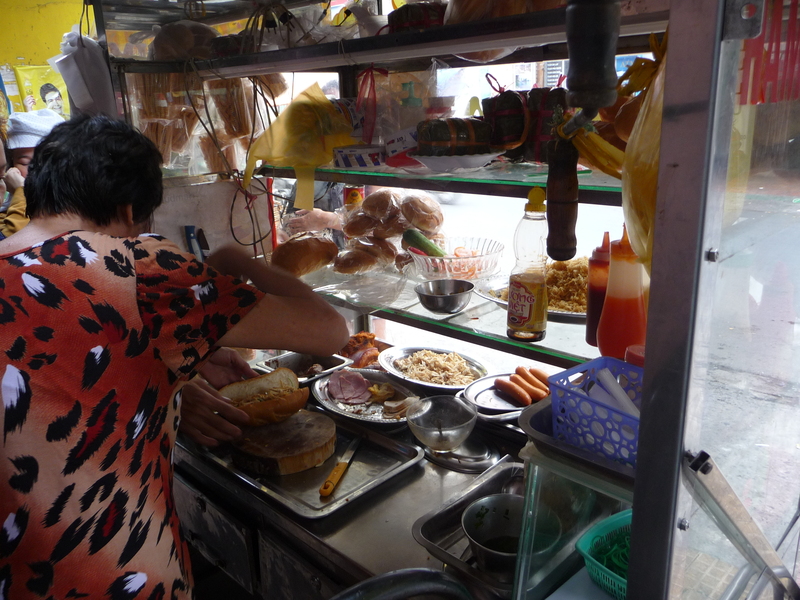 You can always tell a Banh Mi stand by a stack of fresh baguettes that line the small window of the stand. The stands are often run by friendly Vietnamese women that are wizards at preparing sandwiches with chopsticks. Upon arriving at these baguette stations you have the option of eggs, pork, beef, and sometimes chicken – you can stick with one staple or have a combination of your choosing (with or sometimes without a price flux). Once your desired chief substance of the sandwich is chosen your sandwich is dressed with a combination that includes most or all of: arugula, cucumber, tomato, pate, bean sprouts, salt & pepper, soya sauce, and lastly some chili powder or sauce. 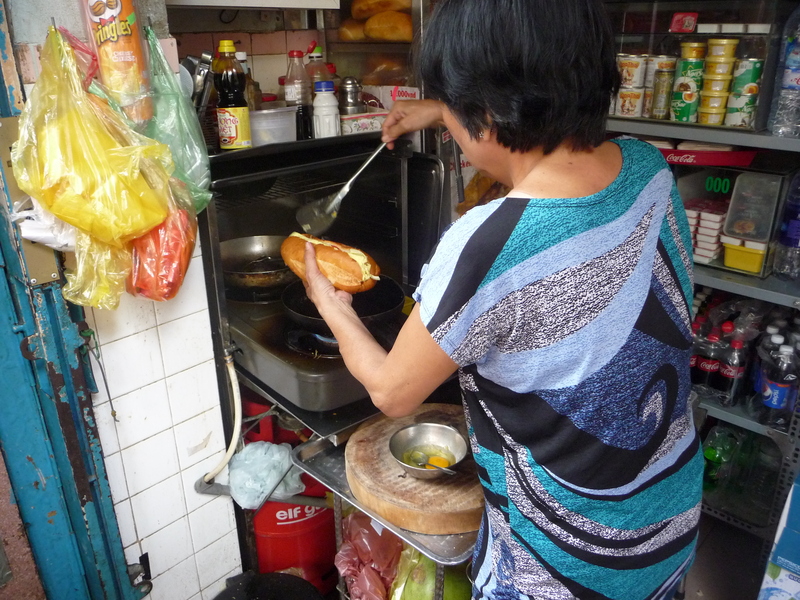 The baguette is usually fresh and toasted atop a coal barbeque while the eggs pop and fry in vegetable oil in a pan, or the meat is cooking on the barbeque (the best Banh Mi stations have a small coal barbeque, but not all do!). The end result is a warm, flavourful, and delicious sandwich that makes a great on-the-run meal or great take away to enjoy on the beach or wherever you like! Besides its sheer deliciousness the most beautiful thing about Banh Mi is that aside from main tourist streets it should never cost you more than 15,000d ($0.75USD). Personally, I found it cheaper to find a budget room, ask to forgo the included breakfast for a slightly cheaper rate and start every morning with a freshly toasted baguette filled with eggs and local greens. Without knowing where a Banh Mi stand would be I was sure a stroll no more than five minutes in any direction would lead me to one. 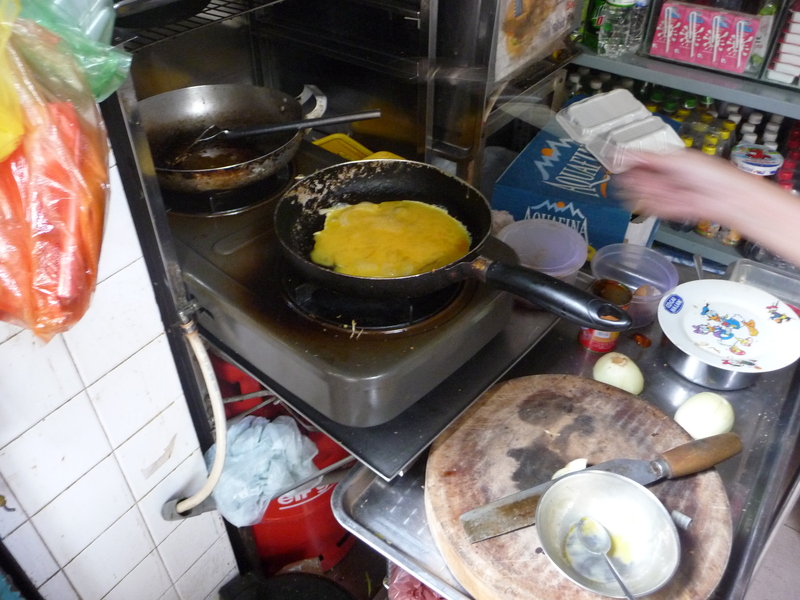 I’d groggily ask the cheery lady for an egg Banh Mi and watch as she filled the frying pan with a small puddle of oil, crack an egg, throw in some salt & pepper, and watch as she began to dress the baguette with local greens whilst listening to the bubbling and crackling sounds of greasy but delicious frying eggs. She’d then wrap the baguettes with a small piece of newspaper, place them in a clear plastic bag, and hand them over as I happily paid next to nothing and thanked her. For lunch, a combination of egg and a meat seemed to be the most fitting, and as a late night snack a combination of a couple meats suited me best. Two a day is average and four a day is certainly within the realm of possibility. It’s amazingly cheap, it’s literally on almost every main street in any town or city in the whole country of Vietnam, and it’s always fresh and delicious.